Overview - From the writer of Training Day comes a gripping, action-packed cop drama starring Academy Award® nominee Jake Gyllenhaal and Michael Peña. In their mission to abide by their oath to serve and protect, Officers Brian Taylor (Gyllenhaal) and Mike Zavala (Peña) have formed a powerful brotherhood to ensure they both go home at the end of watch. But nothing can prepare them for the violent backlash that happens after they pull over themembers of a notorious drug cartel for a routine traffic stop. Seen from the point of view of the officers, gang members, surveillance cameras, dash cams and citizens caught in the line of fire, a 360° perspective creates a gritty, compassionate and intense portrait of the city’s darkest streets, and the brave men and women patrolling them. With so many movies about crooked, corrupt cops steadily growing into the norm, 'End of Watch' offers a breath of fresh air while still keeping to genre expectations and filming in the otherwise trite "found footage" style. Only, the filmmakers manage to make this style seem novel, mixing the POV with more traditional camera views and angles, making an attempt for some semblance of realism. And for the most part, it works to riveting effect. In this day and age, when everyone seems to carry a camera on a variety of devices, it's none too surprising that even criminals would be stupid enough to record their own unlawful activities. And many of them really do walk around with the camera always on. Framing the buddy cop charm with a dark procedural thriller, David Ayer, who made a name for himself with the Denzel Washington-starrer 'Training Day,' takes audiences on a gripping, edge-of-your-seat ride-along with a pair of beat cops drawing undue attention from a dangerous cartel. Ayer also penned this "day in the life" portrait of the courageous men and women who risk their lives protecting the community and upholding the law, recognizing the real civil service they actually provide. We also get glimpses into their personal lives and the sort of familial bond they share with others who proudly wear the badge, admiring their humanity and the daily sacrifice they make. Previous movies from Ayer explored the dark underbelly of The City of Angels and the corrupt cops who monitored its streets. In 'End of Watch,' he shows the other side of that coin, following Officer Brian Taylor (Jake Gyllenhaal) and his partner Mike Zavala (Michael Peña) working diligently, though not without a bit of hot-headedness, to clean up those streets and save the lives of innocent, little children from burning houses. While Taylor ponders on whether his new girlfriend Janet (Anna Kendrick) could be the one, Zavala is happily married to Gabby (Natalie Martinez) and waits for the arrival of their first child. A major part of what makes this film work so well is the chemistry between Gyllenhaal, giving one of his best dramatic performances in years, and Peña, doing excellent at keeping pace with Gyllenhaal. They're a likeable pair who we quickly come to admire and respect. Ayer adds a nice touch by also making them public heroes, winning well-earned recognition for their service. In the middle of this, the two best chums, who spend each day confiding in one another like brothers, slowly find themselves wrapped up in major criminal ring, accidentally busting one operation after another. They are grisly, horrifying scenes of human trafficking, drugs, mutilated corpses and gold-platted assault rifles. Those we suspect behind the disturbing crimes are a frightening maniac aptly-named Big Evil (Maurice Compte) and his equally scary second in command La La (Yahira 'Flakiss' Garcia), who has a penchant for using stolen minivans in drive-by shootings. One scene at a house party where our two everyday heroes have a stare-down with the pair of vicious gangbangers is a terrifically tense moment, cueing in on the inevitable showdown. This is where Ayer gradually turns his gritty police drama into standard action thriller, and the transition between genres is seamless. We're too caught up in the moment to even notice the shift — or the fact that there's no possible way a camera would be filming at that precise moment. But this is also part of the film's success, establishing a feeling of authenticity as two characters we've come to sympathize with intersect with the real dangers of their job. Ayer underscores the directness and straightforward approach of his plot with this tragic irony: the more good deeds they perform, the more they inadvertently put themselves in jeopardy. The film opens with a sensationalized chase through the streets of Los Angeles which ends in a heart-stopping shootout — the action recorded by the dash camera of the squad car — and Officer Taylor (Gyllenhaal) explains the hazards of the job. The sequence seems like the typical voiceover device, but it's not, as the screen weaves around the mayhem created by the black Monte Carlo, making viewers feel as if they're in the driver's seat. It's not until the end that we reflect on the somber, depressed tone in Taylor's voice, contradicting the thrilling action on screen. 'End of Watch' is exhilarating and engrossing, but for the real cops experiencing the dangers every day, it's not an easy ride, because they don't always walk away unscathed or unaffected by the evil of some people. Universal Studios Home Entertainment brings 'End of Watch' to Blu-ray as a two-disc combo pack and a code for an UltraViolet Digital Copy. The first is a Region Free, BD50 disc sitting comfortably on a panel opposite a DVD-9. Both are packaged inside a blue, eco-elite keepcase with glossy slipcover. After several skippable trailers, viewers are greeted by a menu screen with full-motion clips and music. Considering its unique visual style, it is reasonable to expect the video will be a bit less than satisfactory. Shot on a variety of inexpensive digital cameras with lots of jerky movements and meant to be of amateur quality, the 1080p/AVC MPEG-4 encode definitely doesn't compare to other newer releases, yet it is still quite strong with plenty to appreciate. The only real damaging aspect is the contrast, which wavers significantly from shot to shot. In general, it's fairly well-balanced but mostly average with blown-out highlights and some instances of posterization. Thankfully, it's doesn't deter too much from the movie's enjoyment, as it is part of the illusion and attempt for realism. This does affect black levels, however. Several sequences are dull with murky shadows engulfing background information, making the image appear flat and largely lifeless. The color palette, on the other hand, only takes a small hit, but overall, colors are cleanly-rendered and accurate, with bold primaries. Presented in its original 1.85:1 aspect ratio, the digital-to-digital transfer is also nicely detailed, with excellent, lifelike textures on the faces and costumes of the cast. Fine lines in and around the patrol car, the police station, and in the many aerial shots of the Los Angeles skyline are crisp and distinct. All things considered, this high-def presentation is faithful to the intentions of the filmmakers, and it looks great. 'End of Watch' also debuts on Blu-ray with a fantastic DTS-HD Master Audio soundtrack, which, like the video, was intentionally designed for the purpose of creating a realistic environment, not really for pushing the limits of one's sound system. It's a front-heavy presentation, as it should be considering the filming methods used, but it's highly engaging as well with excellent channel separation and superb dialogue reproduction. A variety of discrete effects — mostly the random, chaotic noises of the city — move around the soundstage with convincing clarity and directionality. Dynamics and acoustics are precise and detailed, while the low-end is powerful and terrifically responsive, giving each gun shot a serious punch and the song selections plenty of weight. As an added bonus, the lossless mix also comes with several great splatters of rear activity. Atmospherics are nicely employed while pans are seamless, and the music also bleeds subtly into the side speakers, generating a satisfyingly immersive soundfield that keeps viewers engaged until the final, gripping moments. Audio Commentary — Writer and director David Ayer rides sole for this commentary track where he talks through the usual motions about the overall production, cast and the unique camerawork. Though not terribly insightful, some comments are quite interesting, especially when talking about the inspirations behind the script and Ayer's creative process. Featurettes (HD, 10 min) — Five, two-minute promos made for the internet showing cast & crew members discussing the script, characters, production and the rigorous training with BTS footage interspersed throughout. Deleted Scenes (HD) — Seventeen scenes removed from the final cut. 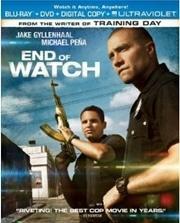 Despite featuring a very familiar plot, 'End of Watch' is a heart-stopping, compelling action thriller that feels fresh, thanks in large part to the energized feel of the "found footage" camerawork. At the center, the chemistry-driven and excellent performances of Jake Gyllenhaal and Michael Peña keep the narrative at a captivating pace until the emotionally shocking final moments. The film debuts on Blu-ray with a great but highly-stylized video presentation and terrifically engaging audio. Supplements are disappointingly sparse, but action and cop drama fans will be generally pleased with the overall package. This is recommended.